Col.(Ret.) Jonathan Fighel served in various operational and field positions in the Intelligence Gathering and Research Department of the Intelligence Corps of the IDF. Since 1999 Jonathan Fighel is a senior research scholar and Director of the Intelligence Assistance for Terrorism Prosecution Department at ICT, IDC Herzliya-Israel. He is an expert on Palestinian terror organization, counter-terrorism, and Middle East affairs. Col. Fighel holds M.A degree in Middle East Studies from Tel Aviv University and combines academic and operational experience in combating terrorism. 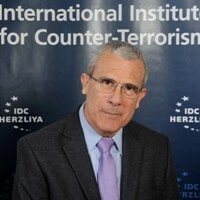 He has extensive counter-terrorism experience, expert on the Palestinian Authority, Islamist organizations (Hamas, Islamic Jihad, Al-Qaeda) the Palestinian suicide terrorism phenomenon and funding terrorism, the use of the Internet and a tool for propaganda, recruitment fundraising, and as a radicalization catalyst regarding the “homegrown” terrorism phenomenon. He is also a member of the International Academic Counter Terrorism Community (ICTAC). A media commentator on security counter-terrorism, he has lectured in a number of universities and law enforcement agencies around the world, including the US, India, Italy, Singapore, Turkey, Australia, Spain and Germany. Col. Fighel is frequently invited for lectures and orientation courses in IDF, Israel National Police, The Border Police, Israeli Security Agency (ISA), FBI, N.Y Police, TSA, Scotland Yard, London police and NATO- COE-DAT Center of Excellence Defense Against Terrorism in Turkey. The Israeli Defense Minister appoints him as a member of academic and governmental research teams on Palestinian suicide bombers and was a consulting member of the Minister of Transportation’s advisory team. On June 27, 2013, Hizb ut-Tahrir’s ideology regarding Palestine took a dramatic and worrying turn: Hizb ut-Tahrir’s Web site published a charter, which called for the establishment of an Islamic Caliphate in Palestine and for the embrace of Jihad (in its violent sense). In November 26, 2013, three terrorists belonging to a terrorist operational cell affiliated with Hizb ut-Tahrir were killed in an operation carried out in Yatta/Hebron by Special Forces of the Israel Security Agency (Shin Bet), in cooperation with the counter-terrorism unit of the Israel Police Force. The group, which was active in the area, was apparently about to carry out a terrorist attack. Two guns and several explosive devices were found in their vehicle. This operation was closely preceded by the arrests of several members of the terrorist group from Yatir and Nablus. This operation marked the first time that Israeli Defense Forces had encountered armed members of Hizb ut-Tahrir in the West Bank, who were in the advanced stages of planning to execute a terrorist attack. One of the main contributions of the Brotherhood to the political-social Islamic revival of these last generations was the development of the concept of the western “crusader” cultural threat to the Muslim world. According to this concept, the Muslim world is under siege and is facing an existential threat which can only be solved with the reestablishment of the greater Islamic state founded on the principles of exclusively Sharia rule.